Visit us to find out why Hostel Chimenea has been constantly awarded, highly recommended and favourably reviewed by hundreds of guests and the most important travel guides! 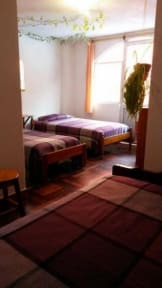 Hostel Chimenea is located two blocks from the central square, next to an impressive 80 meter waterfall and across the street from 'La Virgen' hotsprings, the most famous thermal baths in Baños, which have stimulating health restoring properties. From the bus station, walk 4 blocks along Calle Maldonado and turn left onto Calle Martinez. From there, you'll find Hostel Chimenea around six blocks along on your right. Hostel Chimenea is open 24/7 and provides shared and private sleeping accommodations: from 4-6 beds dormswith ensuite bathroom and hot water all day, toprivate rooms for 1-3 people, with firm matresses, wood decorations, balconies and excellent views of the surroundings. Payment methods: only cash upon arrival. Check in from 14:00 PM to 00:00 . Breakfast not included - 3.25 USD per person per day. This place was amazing. The room decor was cute with a ceiling plant and hand painted art. We had a view of the mountains and waterfall in front of us while we drank our morning coffee, and breakfast was cheap and large. Would highly recommend this place to any one traveling by themselves or as a couple. 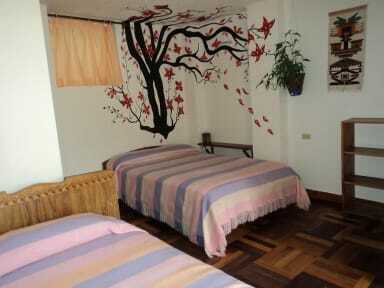 Absolutely wonderful place to stay in Baños! The rooms were very spacious and the private bathrooms were a huge plus. Spectacular views of waterfalls from the rooftop cafe were only made better by the incredibly kind and accommodating staff. If you ever find yourself in Baños, Chimenea is the place! The hostel is amazing value for money. Rooms are very clean and comfortable, towels are changed everyday and rooms cleaned (which is more than most hostels), and the views from both the front and back of the building are stunning (mountains and waterfall). The kitchen facilities were the only thing that could do with re-doing, there were minimal and very old. Good hostel! More a hotel than a hostel, but it was still very good none the less. Short walk into town. Breakfast extra on the roof terrace which was nice. Staff always polite and helpful. Highly recommend! The hostel was beautiful and tranquil. The private room we stayed in was very cozy and bright. The staff was extremely helpful and friendly. Would recommend this place for any type of traveler. The fruit salad and toast on the rooftop restaurant was also amazing. We are from Scotland which is a country of Great Britain. England is only one of four countries that make up Great Britain. The option of Scotland is not available on your list. This is disappointing. Other than that our stay was very pleasant as usual.